Pupils at Burnhaven School in Peterhead are benefitting from regular visits to the library. 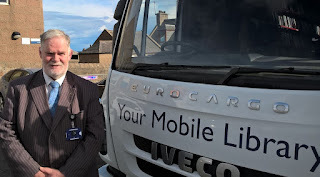 But instead of making the long journey into the town centre, the library comes to them, thanks to the intervention of local councillors Stuart Pratt and Stephen Smith. “Stephen and I attended a recent meeting of the Burnhaven School Parent Council where we heard of the difficulties in accessing the town’s library due to the logistics of getting the children there and back. Given the school’s location right on the edge of the town it would take too long for children of that age to walk there and back and valuable lesson time would be used up. “I had previously arranged for the Mobile Library to call at Longhaven School, where the service proved very popular with the pupils, so was pleased to be able to assist Burnhaven School in this regard.